Meg and Diane decided to have a surprise birthday party for Paula. 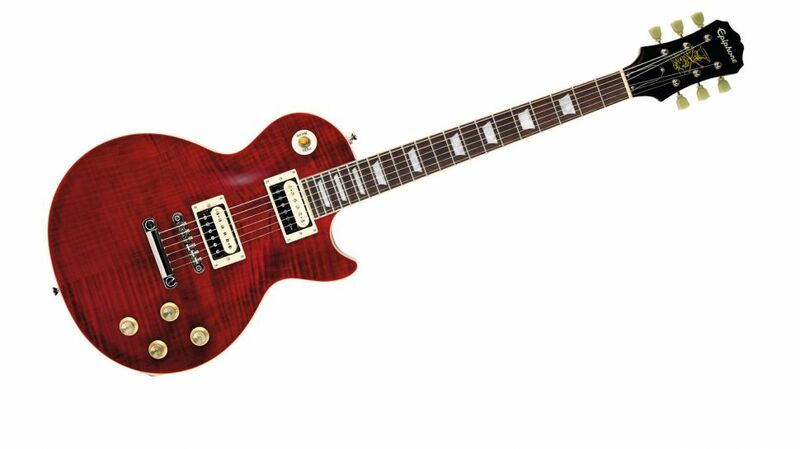 Meg got her a really fancy Epiphone Les Paul electric guitar as a gift. Wow. Others got together and got Paula an amp. Wow again! 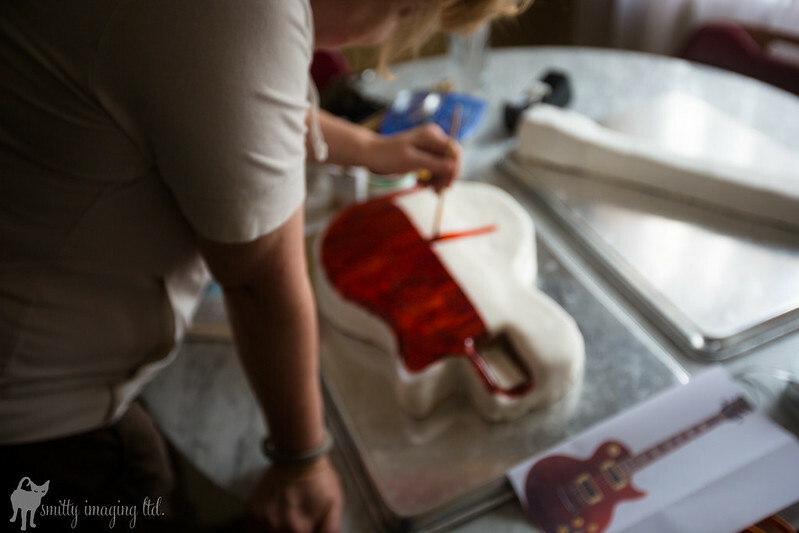 Meg and Diane asked if I could make a guitar cake for the party. Of course I will! I answered. 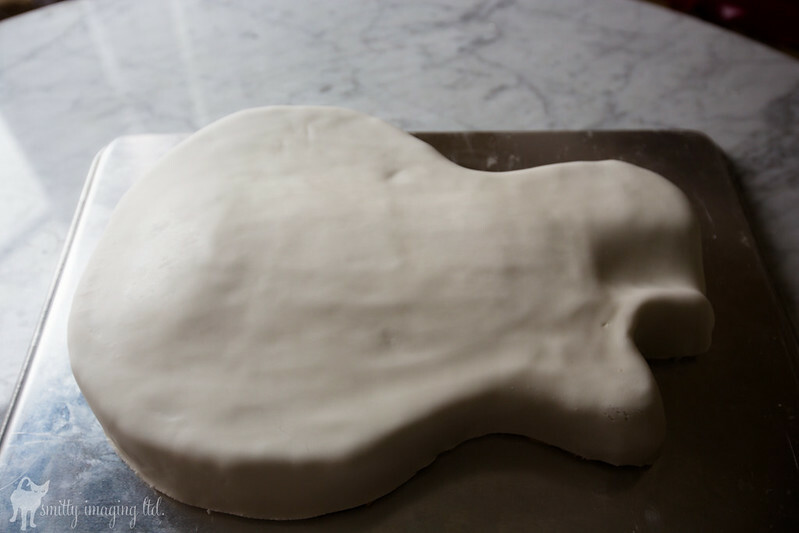 One minute later I was frantically researching “guitar cake” on the internets. There were some REALLY cool ones and some very hokey ones. I wanted to make a really cool one naturally. And so it began…. 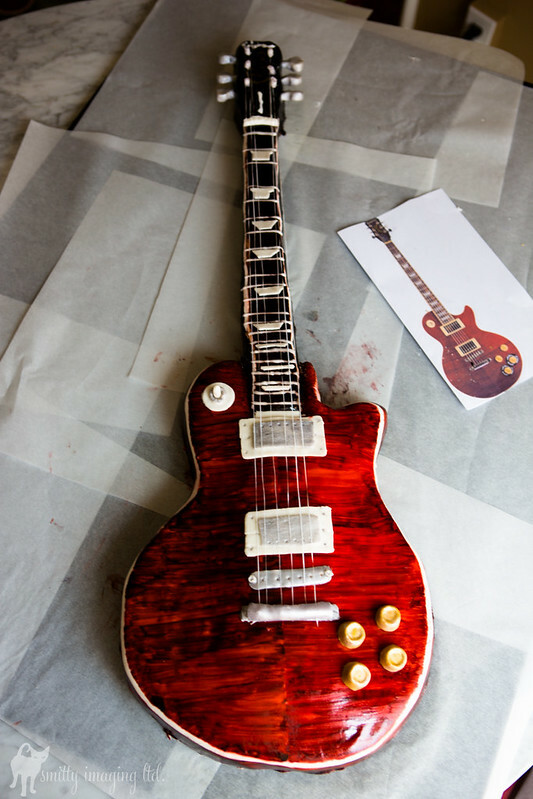 First, I got a photo of the guitar Meg was buying. Which was essentially this one. I got the photo and put it into Photoshop and blew it up to make a template. Of course I did that about 5 times just to get the size right…and every time I had to print it on 4 sheets of paper and cut the shapes out and tape them together. I finally got a good size, not life size but pretty close. Then I had to bake the cakes. Of course it had to be either Walnut or Maple being that it’s a guitar and all. I decided on maple and bake two huge sheet cakes. Each sheet was two cakes worth of batter. I then put the cakes together filled them with maple buttercream with an added bonus of a thin later of hazelnut praline. Sooo good! After the cakes were in the fridge to solidify a bit I took my template, now transferred to cardboard and cut the body and the neck out separately. Frosted each with more maple buttercream and saved the extra cake parts just in case! After the body parts were refrigerated to solidify I rolled out fondant and covered each cake with the smooth white covering. It was my first time and I thought it would be hard but really wasn’t. Like pie dough but easier. As soon as fondant was done I started the coloring. Using red, burgundy, and a tiny touch of black gel food coloring and vodka (yay!) I took a small stiff paintbush and painted from the center outwards. 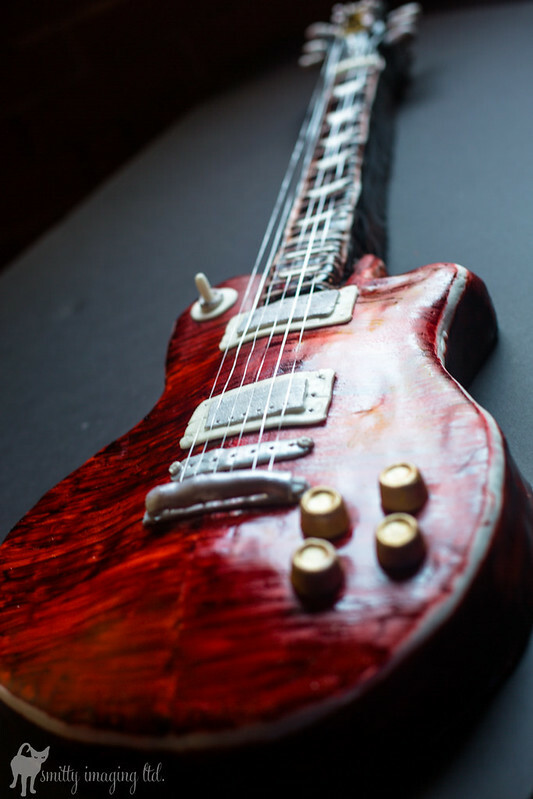 I used a narrow strip of parchment to keep that white edge of the guitar. The sides were the same color but a bit darker (more black and a little brown). Neck was wood colors (brown, black) and head was all black. The gold knobs were Rolos covered with a very thin later of fondant to hold the gold food coloring. All the other parts were made of molded fontant and either sprayed with silver food coloring or left white with a bit of pearlized powder. 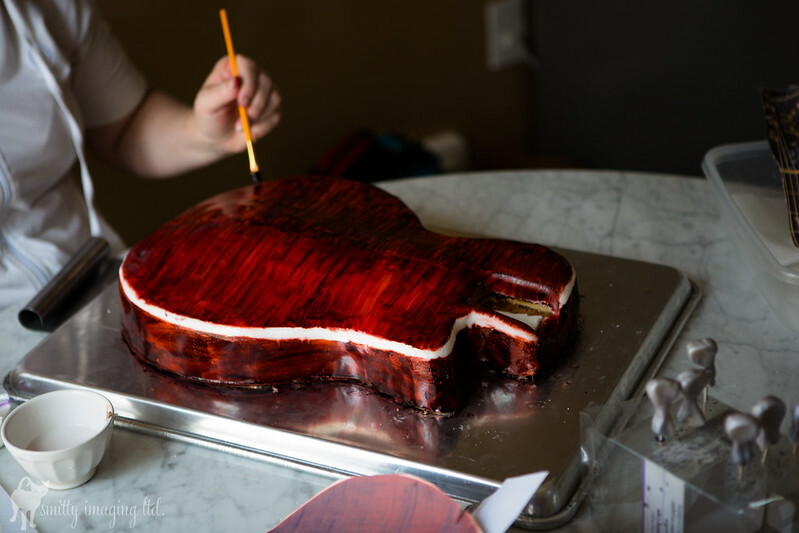 The frets were just piped with simple icing. Strings were dental floss tied to toothpicks! Well the party was truly a surprise. Paula did not know and was a bit shocked but happy. The cake was a hit, tasted great and fun to chop up. It took me about 4 days to do all of this because I didn’t know what I was doing. Next time it won’t be that hard…if there is a next time! This entry was posted on Saturday, August 3rd, 2013 at 20:57. It is filed under Food, Uncategorized and tagged with birthday, birthday cake, cake, fondant, food, gift, guitar, surprise. You can follow any responses to this entry through the RSS 2.0 feed. Fun to revisit this amazing cake! I was so honored to have it for my birthday. And OMG, the flavor! I remember I saved some of it and ate it months later (after freezing it) and it was as good as the day you made it. How fortunate am I to have such an incredible & talented baker, artist and friend! 🙂 My pleasure Paula. 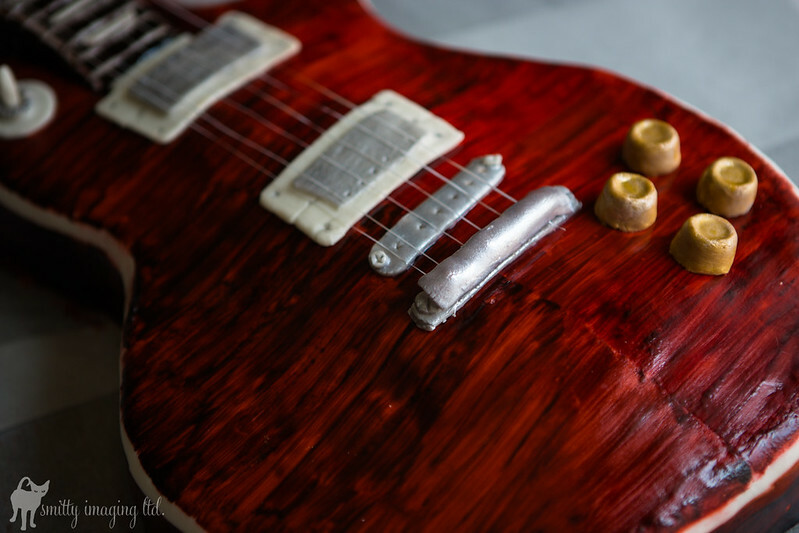 Would make you a fancy guitar cake anytime!